My husband recently purchased one of your Hensley Arrow hitches for our Lance camper, and we had our inaugural run with it this weekend on a trip from our home in Grand Lake, Colorado to Grand Junction, Colorado. I hate your product; if you’ll indulge me for a moment, I will tell you why. We began our trip with a stop at the Ace Hardware for Craig to pick up a tool he needed. As we turned into their parking lot, he starts asking if I noticed how tight the turn was, and explained that with the new hitch, he did not have to leave such a wide berth when making turns. He pointed it out yet again when we left the parking lot, just to make sure I understood. I never before paid much attention to how many semi-trucks share the road with us, until Craig felt compelled every half hour or so to let me know one was about to pass us, and I should notice how little the trailer swayed in their wake. He also mentioned it when we passed the Big Rigs, so I fully comprehend that it doesn’t matter which side the truck is on when being passed or passing. Our route along I-70 brought us through Glenwood Canyon. Guess what doesn’t sway on winding highway twists and turns? Did I mention the trip from our house across the state is a little over 4 hours? Indeed. Fours hours of traveling inside an unrelenting infomercial about the benefits of a hitch. A *hitch,* Mr. Powell; for FOUR hours. Even late-night television does not extoll the benefits of a product for longer that 60-minutes. Seriously, you need to develop a product that does not turn grown men into drooling fools during a long road trip. 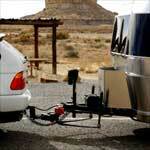 I am now dreading our excursion to Yellowstone National Park this summer, all because of your Arrow hitch. Thank you very much.